Babblings of a Mommy: Crane Humidifiers Review & Giveaway!--CLOSED. Crane Humidifiers Review & Giveaway!--CLOSED. Have a little sick one at home? Then you'll definitely want to hear about Crane! They were the first to put in the "fun" into ordinary looking humidifiers. 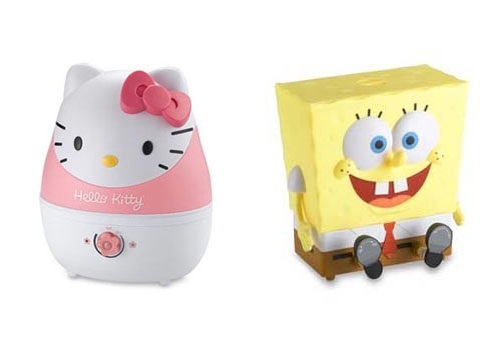 They feature an amazing selection of childrens cool mist humidifiers. These cool little devices are so adorably cute, yet offer an excellent way to relief cough, cold, and flu symptoms by providing your little ones with moisture for nasal congestion, cough, sinus irritation, and even helps with dry skin and chapped lips! This uber cute elephant that Crane was kind enough to provide me with, couldn't have come at a better time. My daughter has been sick (on and off ) for WEEKS now, and just this week started suffering from seasonal allergies. Poor thing couldn't catch a break! So we plugged in this cool mist humidifier in her room, put it on an elevated surface, and by the second day she was congestion free--I couldn't believe it!! What I really like about the humidifiers is that, not only does it give you lightning fast results, but it's also very easy to use (even for me). It's surprisingly quiet, and holds up to one gallon of water. It can run up to 11 hours, and even has an automatic off function if the water is running low. I'm completely in love with this thing!! I'm not kidding. If you're family is always getting sick--you need to invest in one of these babies. They will make your lives so much easier! Crane is also offering one lucky Babblings of a Mommy reader a FREE Cool Mist Humidifier of your choice!!!!! Winner will get to choose from the: animals, traditional, or licensed series ONLY. (No sport or nursery styles.) A $45-$70 value. Visit Crane USA on Facebook and "Like" their page. Be sure to leave me a comment here telling me you did and what humidifier you would choose if you won! Follow me on Twitter and tweet this to me: "I hope I win the Crane Humidifier at http://babblingsofamommy.blogspot.com @babblingofmommy"
It's that simple! Remember each one counts as a different entry so be sure to enter them separately. Giveaway ends March 24th . A winner will be selected by random.org and will be announced on my blog, so be on the lookout for your name! *Product was provided for review purposes. All opinions stated here are my own. See disclaimer/disclosure for more info. Like Crane USA on FB and love the Penguin. I liked crane, I liked your FB, I tweeted, I voted and I'd love the elephant. Thanks! I like them on Facebook (Danielle Knapp) and I would get the penguin. "like" you on FB! and Commented! I already like Crane on FB. I would choose the penguin, because he's adorable! Voted for you on both the Fence and Mommy Blogs. I liked them on facebook (well, my husbands.. I deleted mine a long time ago!) and I think the frog would look awesome in my son's nursery! Thank you & check out my blog for my most recent giveaway! I like their pg and I would get the duck humidifier! I like Crane on Facebook and would probably get the elephant. So cute. I like Crane on FB and I would pick the cute little penguin. I follow you on twitter and re-tweeted the giveaway. I like Crane on facebook and would choose the elephant! I like Crane USA and I would get their elephant humidifier! I liked Crane on FB! I'd love to have either Hello Kitty Cool Mist Humidifier or Dog Cool Mist Humidifier. So cute! I'm a Facebook fan and I've left a msg. on your wall! I like Crane on FB(kelly Delrosso) and I like the Spongebob style if that is available or the frog design. I think I would get the elephant, that or the pink traditional one. I like Crane USA on Facebook and I would pick Hello Kitty. I'm a GFC Follower as strawberry. I like you on facebook and left a comment for the giveaway. I like the Pig Humidifier! I like Crane on Facebook (Elena Shkinder-Gugel). I am subscribed to your blog via RSS. I like you on Facebook and left a comment (Elena Shkinder-Gugel).